Ok there is one thing I have to say about this AMAZING!!!!!!. This one follows another couple Hannah and Nik and omg do I love them. I didn't know much could give Ezra and Kady a run for their money as such awesome characters. I am truly fangirling here. Not only that but on Audio it is phenominal. I can say if you are unsure of audio but maybe want to give it a try go to Illuminae and Gemina. Both are fully cast and you feel like you are really there. Very few audio books keep me as entranced as that. Not only that but the books are amazing as well. (I had to buy a copy as well) So onto the actual review. Where to start. This one is definitely more adult (not sexually but language although all is blocked out some people will feel that way so have to point it out) Nik is a big bad thug while Hanna is the captains daughter. He is also her drug dealer. 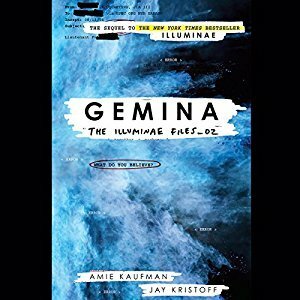 Gemina takes place about the same time as Illuminae just on a different ship. Instead of zombies and a killer AI system we instead have a virus, killer alien things, and hijackers. It is different but yet you still have the same feel as you did with Illuminae(plus the book is written in the same format which I love). This book starts out for about the first 30 min of the audio (about 50 pages I would estimate) but then it goes crazy and nonstop with a ton of twist and turns. I am trying to keep a spoiler free review so at times I might just stop. (as mentioned still fangirling). Hanna is the captains daughter who is dating one of captains officers who watches security cameras (super hot Jackson) . Nik though loves to flirt with her and really actually wants to be with her and they even have a great moment of meeting where she almost breaks his arm. It then goes into where he is convinced to let thugs in and then all hell breaks lose. In a rush these people are taking over the ship and kills lots of people. Hanna in the rush is with Nik who was selling her drugs (he left the meeting point) Then it goes to running for their life. As they work to escape they are separated and have to survive. With Nik's computer genius cousin it becomes a non stop run for your life. Then comes the killer alien things all icky slime. They like to eat brains (kind of a zombie thing) The sense brain waves to attack. After all this there are more and more surprises. So anyways overall awesome book and my review kind of stinks because I do not want t igive anything away. But if you want an experience listen to this audiobook and then follow up with the book (or vice versa) you will not be disappointed. I cannot wait for the 3rd book now.